- or as humans probably came on the dog? In recent time the science moves much: the DNA of humans should be decoded, the sheep Dolly is cloned and " a naked fold mouse " was genetically developed. There is it only being obvious that humans concern themselves with the new technology again with the old question, as and when humans came to the dog. So far at the old dogma, the house dog would have been made before approx. 14000 years by humans the domestic animal few shaken. The thesis humans would have carried a throw of wolves forward and kept themselves these drawn up then during a long period. Over the point in time one was united, everything followed here in the statements of Professor Herre in the institute for domestic animal research, Kiel. 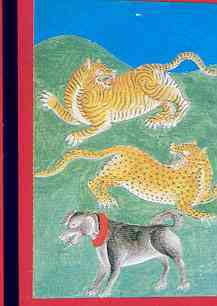 Only the pioneer Eberhard Trumler thought in its "book humans and dog” quite freely about other conceptions of the course of events. How was it now? How did humans come on the dog? United the cynology were also in the conception the fact that the women among early humans were probably, who the domestication - released by the childish schema forced. With nature peoples one can observe also today still the special linkage of the dogs to women and children. New research results of the University of California, Los Angeles 1997 let doubts about these theories arise. Perhaps the conceptions of Eberhard Trumler will actually find in the near future support from further results of new research methods. The publication of the researcher team under Charles Vila` and Robert Wayne, both professors for evolutionary biology over the results of their molecular-biological investigations at DNS paragraph from wolves, coyotes, common jackal and house dogs, initiated a process of rethinking. The present genetic acknowledgement of the descent of the dog of the wolf was assumed immediately in the world of the cynology. The result however that wolf and dog must have already apart-developed contradiction before approx. 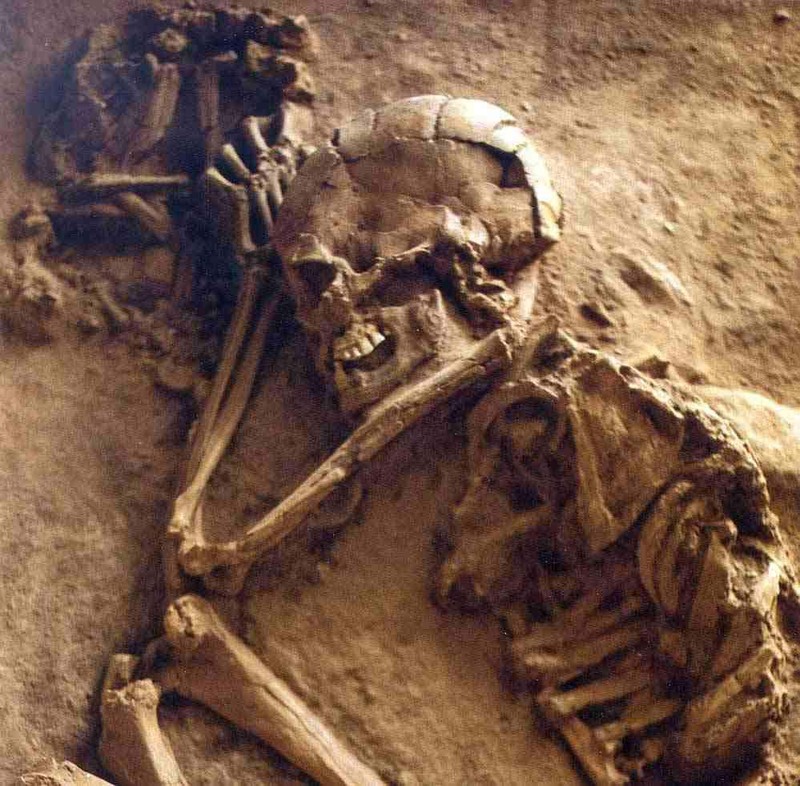 135,000 years genetically released themselves. On the other hand one began to think about it. An acknowledgement of the results from California are the only recently discovered footprints of a dog in the Chauvet cave in France, this are approx. 25,000 years old. This is again a new "visible " proof. Already before 25,000 years the footprint of the dog differed clearly from that of the wolf. To such a modification of the foot bundles in the course of the domestic animal becoming it requires reliably some time. The test results from Los Angeles are however likewise for the Hominid investigation interesting, did not occur nevertheless the early domestication of a trunk of the Canis lupus at one point in time as humans as earliest Homo sapiens still at all in the position were directed a domestic animal to be domesticated. 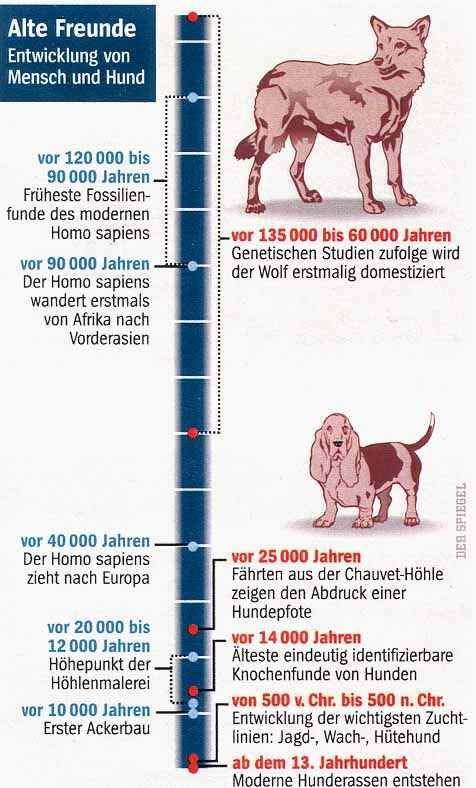 In this time the Neandertaler hominid was far common and only by today's humans was many later displaced. Before approx. 90,000 years the early people moved from Africa to Asia. Perhaps already did Canis familaris participate also on the migration at this time? on the Australian continent to explain help. with humans on the continent come. The wolf (Canis lupus) would have domesticated itself, so the newest theories in the proximity of early humans. Why however? -neither with the early Homo sapiens nor the hominid Neandertaler could he booty wastes of his food competitor access. Certainly the wolf was the better hunter. A handicraft witness of the early human being from this time are not well-known. All founds about show that humans used their food complete. Thus many questions arise to the professional world, with which is however always assumed humans actually bound the wolf. Perhaps had it turned around? Early humans followed his wolves around their food remainder to use. At the end humans are the domestic animal of its dog? As type the dog (Canis familaris) on earth is rather successful by this symbiosis, like humans. Surely already many dog owners have themselves in demand who in their relationship with the dog the domestic animal probably actually are. We go nourishing to the work around also the dog and receive. While we leave thus the house, our dog turns still times over in its " cushions ". We provide for play and movement. Maintenances and cherish him, to the misery we help him still like as nurse with the raising of puppy. Actually quite clearly who whose domestic animal is! OR?